Joy Brantley Day was born in Thomaston, Georgia and earned a bachelor’s degree with highest honors at Tift College and graduate degrees with highest honors at Georgia State University. After an appointment with the Department of Defense in West Germany for almost three years, Mayor Day came to Jonesboro in 1971 as a third-grade teacher at Lee Street Elementary. She rose through the ranks in Clayton County Schools serving as a system Leader Teacher, Assistant Principal, and then Principal. She retired from Clayton County Schools after 35 years of service. Mayor Day has also earned over 250 hours credit in Municipal Training at the Carl Vinson Institute, University of Georgia. She is also a graduate of the Georgia Academy for Economic Development, Regional Economic and Leadership Development. Mayor Day served as an adjunct Professor at both Tift College and Mercer University, specializing in instructional technique and Learning Theory. Mayor Day has been active in many community activities including, but not limited to, the Jonesboro Women’s Club, Women of Clayton County, Tara Kiwanis, Rainbow House Advisory Board, Cross Keys Counseling Board of Directors, Delta Kappa Gamma, Arts Clayton Board of Directors, Clayton County YDC Board, National Trust for Historic Preservation, and Clayton County Chamber of Commerce Government Affairs Committee and the Commerce Education Committee. She serves on the Superintendent’s High Performing Advisory Board, Clayton County Schools. Mayor Day currently also serves as a Board Member of the Atlanta Regional Commission. 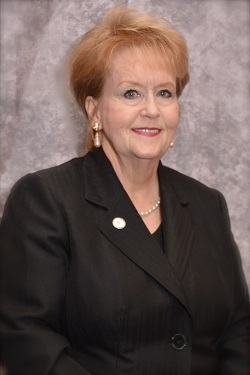 She was first elected Mayor of Jonesboro in 1995 and took office in 1996. Mayor Day is active in the Georgia Municipal Association and participated in a GMA Roundtable concerning the need for increasing interaction between municipalities and boards of education in Georgia. She has served as District Vice President and President for the Georgia Municipal Association. Mayor Day has been recognized by the Georgia Municipal Association with the Certificate of Achievement, the Certificate of Excellence, and the Certificate of Distinction. She served four terms as President of the Clayton County Municipal Association. Mayor Day has received many community accolades including Clayton County Chamber of Commerce Business Woman of the Year, Battalion Chief, State Fire Marshal Corps, Divine Faith Ministries Commitment to Excellence Award, and Woodman of the World Community Service Award, and Grassroots Leadership Institute 2018 Inspiration Award. She was named a Living Legend by We Are Clayton Magazine in 2016. Under Mayor Day’s leadership, the City of Jonesboro was awarded the 2016 Development of Excellence, LCI Achievement Award from the Atlanta Regional Commission. Mayor Day has one son, Brantley Day, who is Community Development Director for the City of Woodstock, Georgia. Her daughter-in-law, Amanda Day, is a consultant and grant trainer with Grant Writers of America. Mayor Day is a small-town girl, steeped in public service; her father served as County Commissioner in Upson County for many years. A 48-year resident of the City of Jonesboro and Clayton County, she lists among her hobbies playing with her two grandchildren, Cole and Kincayd, politics, meeting new people, reading nonfiction material, and gardening. Notable among her great loves is the City of Jonesboro and its people.